Our children see so much prejudice around them - between blacks and whites, haves and have-nots, even thin people and fat people. How can we work against the prevailing atmosphere and teach our children tolerance? Guest Expert Paula Green, Ph.D., says: Studies show that the three areas in which children learn tolerance or intolerance are the home, school and the media, in that order. Even if you have a progressive home, intolerance, as you pointed out, is in the air and children absorb it like sponges. The globalization of trade and capital has also produced the globalization of humanity. We see so much more diversity now. As parents, we take our love for our children as a given. But do we consider whether the way we talk to our children communicates that love to them? Many of us have a tendency to use "negatives" when talking with our kids. "Don't do that," "Stop," "No," "If you do that one more time then...." Do these phrases sound familiar? If so, then it may be time to consider another approach...positive parenting. WHAT IS POSITIVE PARENTING? Children crave attention. It shows that they are important and that their parents care about them. "Breathing in, I am calm. Breathing out, I smile. "Next time you are angry or jealous of your brother or sister, or when you are unhappy with a friend, stop and do this exercise." This advice was addressed to a group of children by a student of the Venerable Thich Nhat Hanh, internationally renowned Zen master, peace activist and Nobel Prize nominee. Dr. Deepak Chopra, the well-known author and lecturer on East-West spirituality has once again translated fundamental Eastern spiritual laws into easy to read Western language. The book is addressed to parents who wish to raise children with values that both satisfy spiritual needs and create the experience of abundance. The book explores specific ways to practice the Seven Spiritual Laws as a family, how to convey these laws to children of different ages, and how to embody the laws in age-specific activities each day of the week. Dear WholeDad: My 12-year-old daughter has an outstanding talent for dancing. I'm not saying that just because she's my daughter. I am able to judge my children's potentials quite accurately. I believe that she herself knows that she has the ability to create an outstanding career in this field. And yet she refuses to display her gift in any public way. The only times she is prepared to dance is in the informal setting of our nuclear family. No words of positive reinforcement will persuade her to develop her skill. On the one hand I cannot and don't believe in forcing my kids to do things that are not part of their mandatory education, yet I fear that if I cannot convince her to maximize herself, she will regret not having "seized the day" when it is already too late. I have been married to my second husband for seven years. The oldest of our four children is from my first marriage. My ex-husband left when I was four months pregnant with my son, so he has never seen him or had any contact with him. My husband and I started dating when my son was four months old, and he adopted my son six months after we were married. The boy is now 11, and we are not quite sure how to explain to him that his dad is not his biological father. How should we go about this? 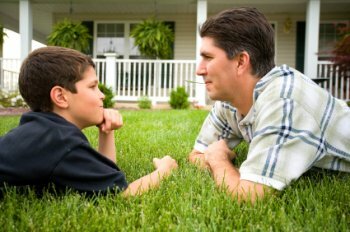 Although my husband and son have a wonderful relationship, my husband is quite concerned that our son will no longer think of him in the same way once we tell him, or even worse, he will want to see his biological father. As parents, my husband and I used to spend a great deal of our time hobbling around with at least one foot in our mouths. My reaction to teen problems is often of the knee-jerk variety, and my common sense goes out the window when confronted with teenage angst. My husband goes stonily silent, and gives all comers "the look." So, what is the solution, besides constant treatment for hoof-in-mouth disease? Write it! Five years ago, when my eldest child turned 13, and turned on the puberty fire full blast, I gave her a small, fat, lined notebook. It began with this forward: "My dearest daughter, today, you are on the threshold of adulthood - and I give you this notebook as a means to an end.